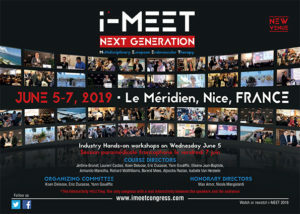 We are very pleased to announce the 2019 edition of I-MEET congress at the Meridien hotel in Nice on June 05 – June 07. As a pioneer in the Live education, this two days and a half meeting will focus on teaching and sharing. Interactivity will be at the core of the program through clinical cases, videos, debates and audience discussion. The final detailed program is available on www.imeetcongress.com. It will address the hot topics of endovascular techniques and procedures. You will have the opportunity to take part to hands-on workshops on Wednesday afternoon. Do not forget to register. And book your seat for the official dinner on Thursday night on the Meridien Hotel’s beach to share with us a unique moment of conviviality. We look forward to building endovascular synergies with you and our renowned international faculty.